so back in high school when i was really cool i had a livejournal, or five. i also had a xanga, but that's besides the point. livejournal was basically a blog site before blogging was cool. anyways, one month i thought it would be really fun to post every single day, but only write one sentence. it was fun because i had to be really creative. if i had a deep thought or a funny story to tell, i had to figure out a way to share that in just one sentence. it's a form of art, in a way. now they sell five year journals where you do exactly this, and i have thought about getting one! but five years is a long time to remember to write a sentence each day! i've been thinking a lot about words lately and how much i love them. i love reading words, writing words, quoting words, etc. basically anything that has to do with words i just love. most of the time it's those short little snippets that i really zero in on and appreciate. i find quotes everywhere & whenever i read a book (even fiction books) my highlighter adds so much color to those black & white pages! there are also certain lyrics of songs that bring tears to my eyes every single time i hear them. i just love, love, love the power of words. so for the month of July i'm going to try this challenge again. but instead of blogging one sentence every day, (because let's be honest that would be annoying), i'm going to be doing the one sentence challenge on twitter. (crossing my fingers all of my sentences can fit into 140 characters!) i am entertaining the idea of doing a weekly recap post of the challenge on the blog, though. some will be silly, some will be serious, and hopefully some will be funny. you can follow along on twitter or the widget on my sidebar. 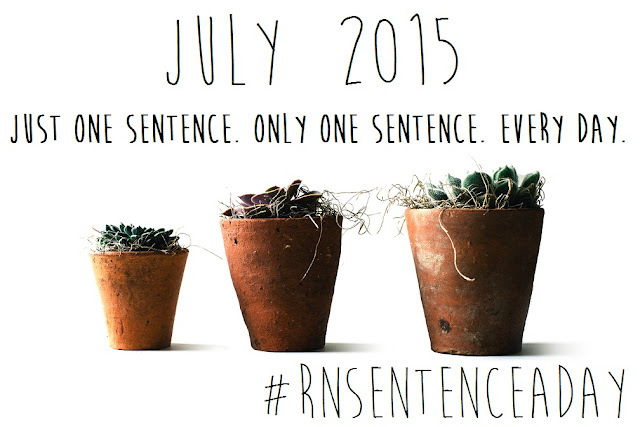 or you can join in by using the hashtag #RNsentenceaday for the month of July! have you ever done a similar challenge? I've done this for the past 2 months & my June post goes up on July 1st... I love keeping a blog ongoing in my drafts & update it every day. I love looking back at it myself ... memories fade so quickly. Nice to have just one sentence bring back a full day. I love this idea! I hope at the end of the month you'll come back and maybe do a post that lists every single one of your sentences! This is a really fun idea! I think it's a great idea to share on Twitter. I agree that a blog post every day with one sentence might be annoying, but please do a recap at the end for us! I have the book sentence for 5 years by Gretchen Rubin. I haven't used it as often as I like. I probably should get back to that. My biggest thing is when I miss a few days I want to go back and catch up. I need to give grace to be alright with not doing everyday. great idea! i will definitely do a month recap post! :) it'll be fun to see them all together!